January | 2016 | PlugInCaroo… Karo plugin… abhi!… save the environment!!! Solar freakin’ roadways! No, this is not the crowdfunded solar road project that blew up the internet a few years ago, but is a collaboration between Colas, a transport infrastructure company, and INES (France’s National Institute for Solar Energy), and sanctioned by France’s Agency of Environment and Energy Management, which promises to bring solar power to hundreds of miles of roads in the country over the next five years. One major difference between this solar freakin’ roadway and that other solar freakin’ roadway is that the new Wattway system doesn’t replace the road itself or require removal of road surfaces, but instead is designed to be glued onto the top of existing pavement. The Wattway system is also built in layers of materials “that ensure resistance and tire grip,” and is just 7 mm thick, which is radically different from that other design that uses thick glass panels (and which is also claimed to include LED lights and ‘smart’ technology, which increases the complexity and cost of the moose-friendly solar tiles). According to Global Construction Review, tenders for France’s “Positive Energy” initiative have already been issued, and tests on the solar roadway panels will begin this spring, although the exact locations (and costs) for the project have not been specified. No word yet on whether these roads will be moose-friendly. This entry was posted in Uncategorized and tagged Colas' Wattway, France Solar, solar, Solar Panels, Solar Pavement, Solar Roadways on January 30, 2016 by PlugInCaroo. This entry was posted in Uncategorized and tagged Electric Bike, electric motorcycle, Electric scooter, EV, tork, tork motors on January 19, 2016 by PlugInCaroo. Quadrofoil is a hydrofoiling personal watercraft (PWC), but unlike other PWCs the Quadrofoil produces marginal noise pollution, zero emissions, and creates only the tiniest of waves. As a result, the company claims the quad-finned watercraft could in theory access more environmentally sensitive areas where noise and wave disturbances are prohibited. This entry was posted in Uncategorized and tagged Boat, Elecrric, electric boat, electric speed boat, Hydrodynamic, hydrofoil, Personal Water Craft, PWC, Q2A, Q2S, Quadrofoil, Quadrofoil - The Electric Speed Boat, speed boat, water craft, wind speed on January 14, 2016 by PlugInCaroo. 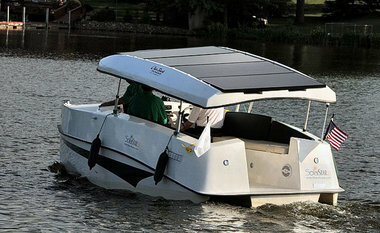 Mike Greenlar / The Post-Standard The Solar Star boat skippered by Robert “Bull” Meacham of Arizona turns in the Seneca River before docking at Cooper’s Marina in Baldwinsville. The boat was towed 2,300 miles from Arizona on land and put in water at Tonawanda, NY. His answer is always the same: The boat doesn’t have one, because it’s solar-powered. The solar panels on the roof power the batteries, and the batteries power the motor. “We’ve been driving this since Buffalo, and we haven’t put a dime in it,” he said early Thursday evening after he and two compatriots arrived at Cooper’s Marina along the Seneca River in Baldwinsville. This entry was posted in Uncategorized and tagged Bruce Walton, Caple, electric boat, Herkimer, Meacham, Solar Boat, Solar powered boat, Western New York on January 9, 2016 by PlugInCaroo. Since I was aware of how Tesla Motors is revolutionizing the car industry, I have had ideas to replicate a similar business model to help advance the earth’s transition of water transportation off fossil fuels and towards electricity. Tesla Motors has announced many times that they would sell power-trains to other companies, and the boating industry is one that is long over-due for innovation. Are there any individuals (engineers and investors), with given skill sets or similar drives, interested in a start-up a company that would provide compelling, high-performance, electric boats? This entry was posted in Uncategorized and tagged battery poewred boats, Boat, electric boat, electric boat manufacturing, Elon Musk, Startup, Tesla, Tesla Motors on January 9, 2016 by PlugInCaroo.